I have few beloved memories from childhood. One that persists takes place at my grandmother’s dining room table. The table is massive, one of those old world mahogany tables with carved legs. My grandmother, my mother and two of my aunts are standing at each side of the table, like points on a compass. There is a slab of dough in the center, and they are very cautiously pulling and stretching it into a rectangle. They are making strudel the old way. It cannot be rolled, and they believe if they tear the dough it will be ruined. There are ceramic mixing bowls filled with apple slices sprinkled with lemon, so they won’t turn brown.There is another bowl with a mixture of sugar and cinnamon to sprinkle over the fruit. I am kneeling on a chair with a handful of raisins, and it will be my job to scatter raisins over the apples. I am watching very intently, so I’ll know how to take my place at the table when I grow up. But which aunt is the fourth woman? I cannot picture her. When I think back to that time I am unsure that the four women could ever have been at my grandmother’s at the same time. One never came,as far as I remember, and the other - how could those long, perfectly painted and pointed nails stretch dough? But I can still feel the raisins in my very young hand. 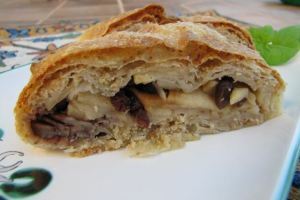 It must be a real memory, I tell myself, I have never looked up the recipe for strudel, (at least I don’t think I have), so how would I know it had to be stretched? Neuroscience says that the mental images for memory and imagination arise from the same place in our brain. If that is true, than memory is even less trustworthy than we think. Cognitive psychologists add that we don’t remember an actual event - just our last remembering. New memories are just a reiteration of the old ones - not the original event. Am I just remembering a fantasy? And then there are mirror neurons. These are special neurons that are activated when we watch someone doing a task, as well as when we are doing it ourselves. Allegedly, this is how we learn, even as infants - a mother can stick out her tongue to the baby, and the baby will imitate her. My hands know the right way to stretch dough, and could I know how to do it if I hadn’t seen it? I loved to watch my mother bake - watch her stir, beat, whip, pour batter evenly into two cake tins. Those motions came naturally and easily when I began cooking years after I left her kitchen. Was that the result of mirror neurons? I have ceased to worry whether my memories are true when they first occur to me because, in time, they become so. or just not worry about it! But sometimes, as in this blogpost, I really am puzzled! I can remember being quite young and realizing by listening to others that stories and memories changed. I remember thinking (with a healthy dose of worry) that I ought to write down everything I could remember about my life each year, so that I would never lose the actual true memories. The fluidity of life narrative had not yet entered my mind. I have puzzled over these same ideas for years. Clearly I did not see enough dough stretched in my childhood as my mirroring neurons perpetually fail me in that arena. I have never seen dough stretched as in that picture--incredible! Thank you for your fluent and thoughtful message, Melissa. The desire to hold on to life and memory must be a condition we all share!